Singh rubbished as “rumour” reports that China has erected a 400 metre high wall to camouflage the construction going on in Dokalam, the scene of a prolonged stand-off between Indian and Chinese armies. 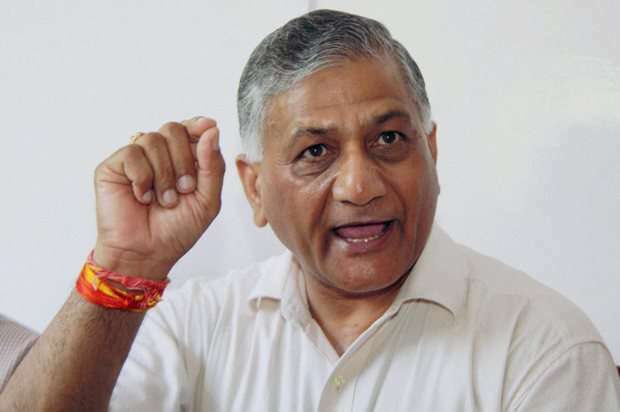 Pakistan is yet to give a sovereign guarantee about the safety and security of Indian prisoner on death row Kulbhushan Jadhav’s wife if she visits that country to meet her husband, Minister of State for External Affairs V K Singh said today. Talking to journalists on the sidelines of an event here, Singh rubbished as “rumour” reports that China has erected a 400 metre high wall to camouflage the construction going on in Dokalam, the scene of a prolonged stand-off between Indian and Chinese armies. The minister also said India “does not care” about 26/11 Mumbai attack mastermind Hafiz Saeed approaching the United Nations to get his name struck off the list of designated terrorists. “Talks are still in progress. They (Pakistan) are yet to provide guarantee on the safety aspect.” Pakistan’s foreign office had earlier this month said it will allow Kulbhushan Jadhav to meet his wife. Responding to Pakistan’s offer of arranging a meeting between the former naval officer and his wife, India also requested that his mother be allowed to meet him too. A military court in Pakistan had in April this year sentenced Jadhav, a former navyman, to death on the charge of his alleged involvement in espionage and terror attacks. India strongly denied the allegation. The International Court of Justice has stayed Jadhav’s execution. Saeed has petitioned the UN seeking removal of his name from the list of designated terrorists on the ground that none of the allegations against him - either related to terrorism or otherwise - have been proved in the Pakistani courts. The banned Jamaat-ud-Dawah (JuD) head, who carries a USD 10 million American bounty on his head for terror activities, walked free on Friday after the Pakistan government decided against detaining him further in any other case. He was under house arrest since January this year. “Do not believe in such rumours,” he said when asked to comment on reports about China having built a 400 metre high wall to hide construction activities in Dokalam on Sikkim-Bhutan-Tibet trijunction. Singh said India wanted its citizens going abroad to believe that their government will help them in the event of any trouble. He said India was working on maintaining healthy relations with every country.